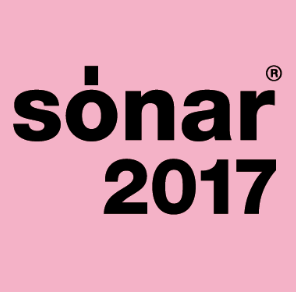 Sónar Barcelona, in its 24th year, will run 15-17th June 2017 day and night and host more than 150 concerts. Last week, the organizers announced the first of what is set to be another mega line-up… also some new additions to the festival will strengthen the offer and strengthen the festival to five days with a new Sunday after show special at the Auditori de Catalunya and an exclusive day for industry insiders a day before Sónar by Day begins, traditionally on a Thursday. 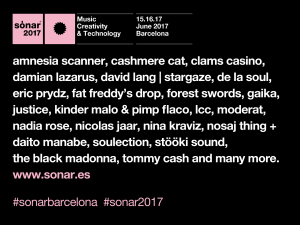 A Christmas season early-bird ticket will cost 170 euros with SonarGift*, which is on sale now with a limited time promotion and includes the Sónar 2017 Pass and, exclusively to Sónar and a month previous to going officially on sale, the entrance to the Barcelona exhibition “David Bowie Is”. The global smash exhibition about David Bowie comes to Barcelona’s Museu de Disseny. First confirmed headliners include: Eric Prydz, Nosaj Thing & Daito Manabe, Nina Kraviz, Clams Casino, Fat Freddy’s Drop, The Black Madonna, Amnesia Scanner, Cashmere Cat, Damian Lazarus, Forest Swords, GAIKA, Kinder Malo & Pimp, Flaco, LCC, Nadia Rose, Soulection, Stööki Sound and Tommy Cash, as well as a special concert at the Auditori of David Lang’s “Death Speaks”, performed by Stargaze on Sunday, June 18th . Sónar by Night will feature the new show from French duo Justice, presenting their newly released album “Woman” in a strikingly visual, onstage spectacular. DJ and producer Nicolas Jaar will return to Sónar this time headlining SonarPub to present his excellent new work “Sirens” in a new live format. Moderat are back with a powerful audiovisual show, consolidating the German trio as the most acclaimed projects in contemporary electronica, and Sweden’s Eric Prydz, a bonafide star in dance music, and one of the worlds most sought after DJ’s will perform at SonarClub. Legendary Hip-Hop group De La Soul present their first album in ten years, live at Sónar. The festival will also feature two of the world’s leading DJ’s: Russia’s new queen of techno Nina Kraviz, whose fans around the world count in their thousands; and The Black Madonna, the politically engaged American house and disco DJ who will this year perform at Sónar by Night, following her success at last year’s Sónar by Day.